Erin Blegen: My Scrap Cabin: C'est Magnifique Bits & Pieces Giveaway! Good morning my scrappy friends :). Just popping in today to share a little giveaway goin' on and then tomorrow I'm back with projects once again. Just wanted to give you all a break after so many of them in a row! But as I said- I've been a creating machine lately, so the projects are piling up! The order of business today is the giveaway of the Bits & Pieces from Leslie's August kit from C'est Magnifique Kits- and it's a great one this month. 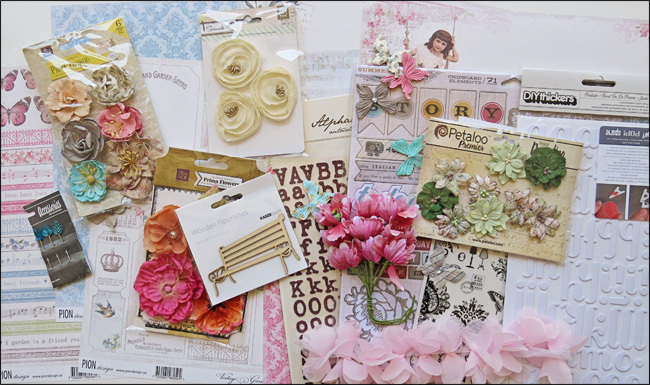 Leslie was away at CHA in July and literally had NO time to scrap - so her Bits & Pieces collection is huge this month! on the "Join this site" button on the left sidebar and you'll be all set. 2. Use the Inlinkz tool at the bottom of the Bits & Pieces post HERE. (just be sure to add the link to your blog post). The contest will close at midnight, August 12. The winner, selected by a random draw, will be announced a few days later. What a pretty mix! Fabulous giveaway! wow what a gorjuss giveaway, thanks for the chance to be in to win. hola! me encantaria poder paricipar me llamo Sara y soy de Argentina un saludo muy cordial gracias ! love all of your work, what a treat this would be!